This is the second video in the series from Pal with the song Morning Sun, filmed by Karl-Johan Hjertstrom. The Emues Crew is glad to be able to share it with you. Did you know that Pal is available on emues.com? Log in and suggest a concert with them, it’s just as easy said as done. Happy Weekend! If you missed the first video in the series, see it here. The Emues Crew comes across a lot of cool music and we are happy to have the chance to feature some of the greatest, coolest and/or newest on our blog. PAL is a band from Southern Sweden. They describe their music as minimalistic and mellow pop. PAL started out as a soloproject with Albin Johansson in 2007, but has grown a lot since then and now features Cristoffer Csanady and Adam Hjertström. Almost exactly a year ago, PAL released their debut album called Weeks. Recently, PAL held a live-session at Studio Möllan in Malmö, Sweden, which was recorded by Karl-Johan Hjertstrom. We are glad to feature this new video of PAL’s new song Paperback. Be sure to check out PAL’s profile on Emues.com and suggest a gig with them. And Follow PAL on Twitter and on Facebook. March is coming to an end and what a fun month it’s been! Many musicians had their anticipated album releases this month, such as Madonna, Miike Snow, The Shins, The Ting Tings, Andrew Bird, Bruce Springteen and many more. Have you listened to them yet? If you have Spotify, you can listen to these Latest Album Releases 2012 now! Are we missing anyone? Let us know. Some of them already have concerts suggested through Emues coming up in April. And you know how that works by now, right? You suggest a concert to the band you wanna see live and when enough tickets get sold, the gig is on! Make sure to get tickets to see Tim the Lion Tamer + Stars in Coma on April 13th at STPLN on The Night Starts Here. 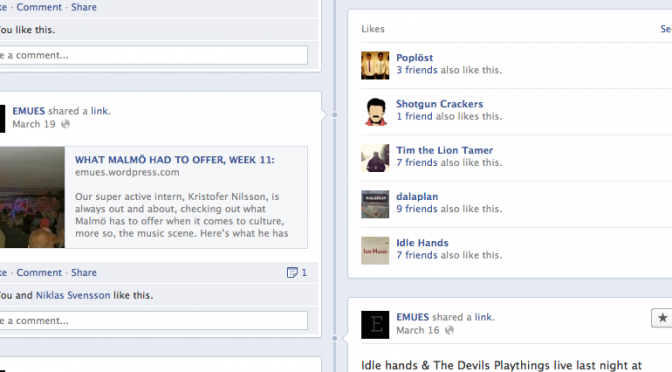 You can see if any of your friends is going to this gig on Facebook, Last.fm or Songkick.com. And on April 27th, you can see Sonja Skibdahl + Funked Up (Funked Up who just played at Hemgården in Lund for the Roskilde Festival Roadtrip) live at STPLN, also on The Night Starts Here. This is gonna be fun, don’t miss it! Get tickets here and check who else is going on Facebook, Last.fm and Songkick. This week in Malmö, YAST (Malmö based band) is the opening act to Zola Jesus at Babel, same day as Deportees play at Mejeriet in Lund for the Roskilde Festival Roadtrip. There’s great music all around, don’t miss it! And remember: if you want to suggest a concert to any of the bands on Emues, just log in with your Emues account, suggest the gig and make it happen! We want more live music brought by YOU!